E-book readers. The market for ebooks and ereaders is growing quickly. Last year when Barnes and Noble came out with their nook, I decided to buy one. I had been lusting over Amazon's Kindle for a couple years, but the price and the fact I hate sprint, kept me from buying one. 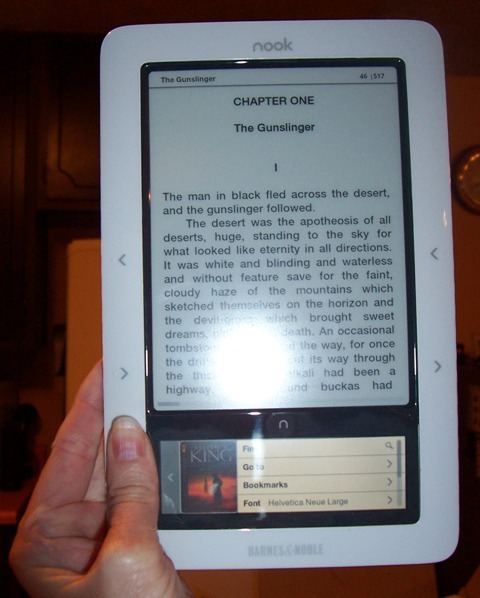 What sold me on the Barnes and Noble Nook: AT&T's 3G Network and Wi-Fi enabled ereader. Plus the color touch screen -- cool! Other cool features - ability to download thousands of free ebooks from google and read up to 10 days before having to recharge the battery. I love reading books - the physical experience of reading - the look and feel of the book, the pages and the smell. Or cuddling up on the couch or sitting out on the patio. You can't do that with your laptop. I wanted the convenience of an Ebook Reader, especially for traveling. How many times have you paid the overweight baggage fee at the airport because of all the books you acquired on vacation or experienced the weight of your backpack killing your shoulders because the book you chose was too heavy? Since I purchased my nook last year, Barnes and Nobles has come out with a less expensive version and gifted original nook owners with a web browser. I really didn't think I would use the nook for everyday reading but have ended up using it 50% of the time. Authors are making more of their books available only in ebook format. Plus there are many who are making some of their e-books free for a limited period of time. Barnes and Nobles ereader blog Unbound is a wonderful resource and has great e-book offers and Free Fridays. I recently discovered WOWIO, who offers ebooks, comics and graphic novels. They have a Book of the Month which is free to download for the entire month. What books have you enjoyed reading lately on your ereader? And if you don't have one, compare them all and tell me, which one would you be tempted to buy? I want an iPad. It's just so shiny-pretty... Besides, I've already enjoyed reading e-books (like this week's review, actually) on my iPhone, so it's a good bet that I'll love the iPad as well.